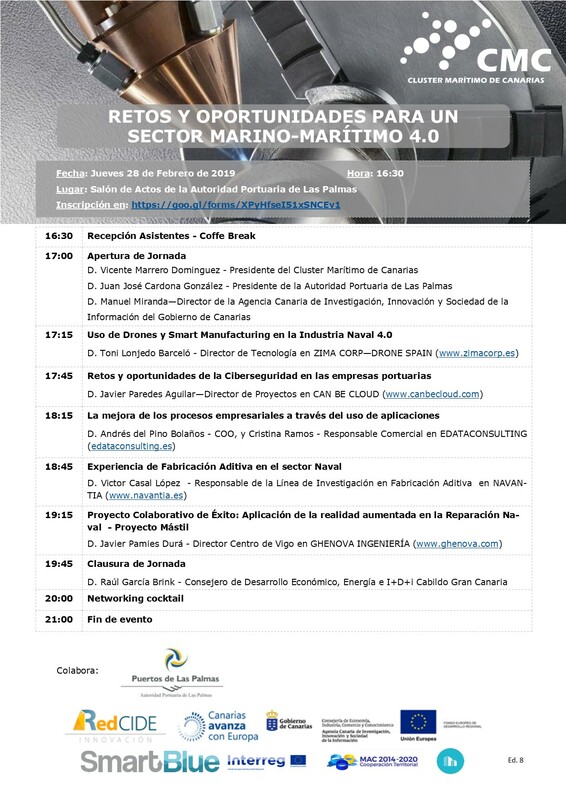 The Maritime Cluster of the Canary Islands in the framework of its SMART BLUE project, included in the INTERREG-MAC 2014-2020 programme and the Red CIDE network, organises the event: CHALLENGES AND OPPORTUNITIES FOR A MARINE-MARITIME SECTOR 4.0, which will take place on Thursday, February 28, 2019, at 16:30, in the Assembly Hall of the Port Authority of Las Palmas. Due to the limited capacity, please confirm assistance: https://goo.gl/forms/XPyHfseI51xSNCEv1. (you will receive an e-mail of confirmation prior to event). The Red CIDE Network (Canary Network of Innovation and Business Development Centers) is an initiative of the Ministry of Economy, Industry, Trade and Knowledge of the Government of the Canary Islands, promoted through the Canary Agency for Research, Innovation and the Information Society ( ACIISI), and co-financed by the European Regional Development Fund, with a co-financing rate of 85% in the framework of the Canary Islands ERDF Operational Program 2014-2020, which provides entrepreneurs with the necessary advice to promote innovation and digital transformation processes in companies.